The cards have been developed out of issues reported by managers from the field across multiple organisations over several years. Within KM assessments and knowledge audits they are designed to help identify common issues and themes recurring across the organisation, framed in ways that managers understand, and worthy of concentrated effort. a. To raise awareness of knowledge and information management issues. b. 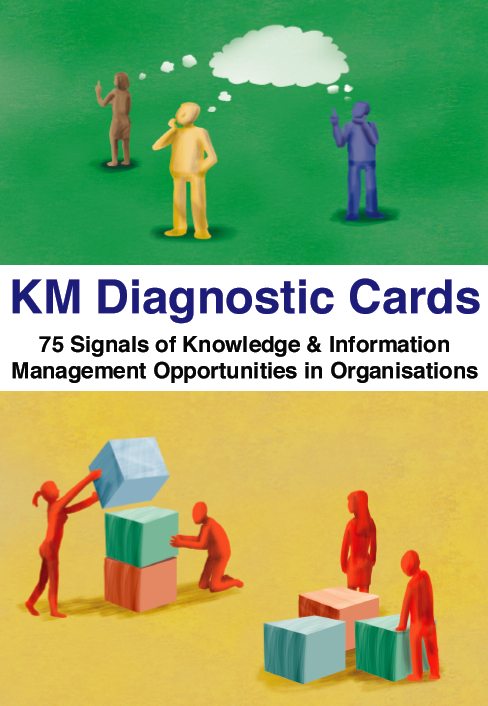 To help managers diagnose opportunities for knowledge management or information management improvements. c. As part of a knowledge audit to identify common knowledge, information and learning needs. d. As part of your needs analysis in a KM strategy exercise. e. With our KM Method Cards to design interventions to meet real needs. If you have any questions please don’t hesitate to contact us directly.